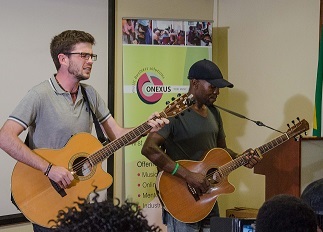 Awesome Africa International Arts Festival has partnered with iLembe District Municipality and Onexus Music Business Solutions to offer musicians in the iLembe region a two- week music business programme. Primarily funded by National Lotteries Commission (NLC) under their Arts, Culture and Heritage. This first week of these workshops took place on September 19, 20 and 21. 80 musicians from throughout ilembe District gathered at the Luthuli Museum in Groutville, eager to learn more about the music business. Topics such as setting goals, contracts and agreements, social media and the performance industry were discussed. Aside from the facilitators from Onexus, guests such as artists Mbuso Khoza, Qadasi and Maqhinga and studio owner Malcolm Nhleko were invited to give the musicians their best tips and advice. “Having received my first record deal at the age of 18, during my last year of school, I had almost no knowledge of the music industry and the struggles, and work involved in 'making it'. This was a new adventure and my first couple of years was spent learning the ropes and grasping a basic understanding of music business, especially with regards to financial implications, tax requirements, and the various laws pertaining to the industry. After five years as a professional musician, I have learnt a great deal and continue to learn everyday. Ones understanding of 'music business' can either make or break a career,” says Qadasi. The programme will continue on September 26 and cover many more topics, such as copyrights and marketing. Next week’s programme will also include a panel discussion on indigenous music and the use of traditional instruments and songs with guests Mbuso Khoza, Dr. Sazi Dlamini and Lu Dlamini.